A pitch deck is a number of slides which summarizes your restaurant. Include at least one year of financial projections and a bio for you and your partners if applicable. 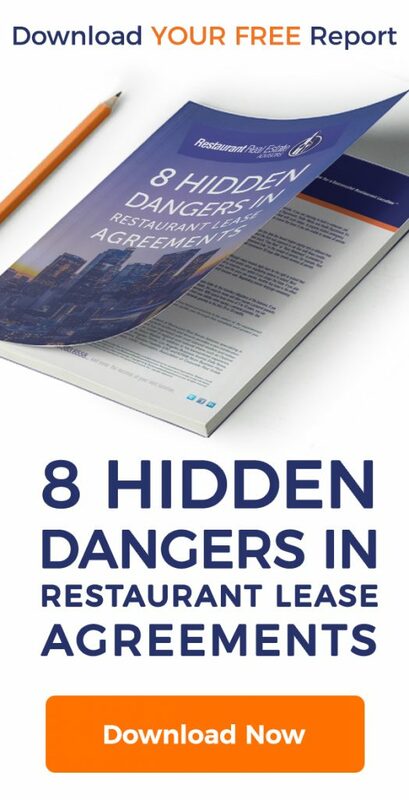 Potential landlords will want to see your menu and you will need a menu so you can define the exclusive use clause in your lease agreement if you plan to locate in a shopping center or other property with multiple restaurant tenants. Credit worthiness is the biggest factor for most landlords when deciding if they will consider you for their restaurant for lease. Be prepared to provide two years personal tax returns, bank statements, credit application and proof of funds available. If you plan to create a limited liability company or corporation it’s a good idea to form the company prior to looking for a restaurant for lease. Where should you look for a restaurant for lease? Your concept will greatly determine which neighborhoods you should consider when you start your search for a restaurant for lease. Is your concept fast food, fast casual or fine dining? Are your target customers lunchtime employees or suburban families with kids? The area that defines 80%of your potential customer base is called a trade area. Your trade area should consist of a large enough population that matches your ideal customer and convenient enough that they can visit your restaurant within a short drive or walk. There a few primary methods to find a restaurant for lease. Just as Amazon changed how we shop for almost everything, the Internet has changed how we find a restaurant for lease. Most searches begin with a search on the internet. 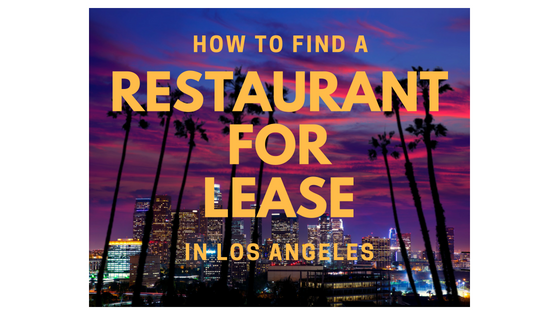 If you search “restaurant for lease” or “restaurant for lease in Los Angeles” on Google, you will find multiple websites and restaurant real estate advisors that provide information about available restaurants for lease. Loopnet is the largest commercial real estate website and includes all property types. They recently changed their business model so it’s becoming less useful when it comes to finding a restaurant for lease. BizBuySell.com advertises restaurants for sale, but you may find restaurants for lease or consider buying an existing restaurant as an alternative to finding a vacant restaurant for lease. RestaurantForSaleorRent.com is a new site as of the time of this article. RestaurantForSaleorRent.com tracks every restaurant for lease and restaurant for sale in the most popular neighborhoods of Los Angeles. You can search for a restaurant for lease on your own or have one of their advisors do the work for you. Either way, once you find a restaurant for lease your advisor will handle the details at no cost to you. Most restaurateurs can save time and achieve better results with the help of a commercial real estate agent or broker experienced in finding a restaurant for lease or using a restaurant real estate advisor that specializes exclusively in finding restaurants for lease and sale. An experienced broker or restaurant real estate advisor will have extensive relationships with brokers, landlords and restaurant operators that might want to sell or assign their lease. Most brokers and restaurant real estate advisors will have access to expensive research and databases of restaurants for lease and sale that are not available to the public. If you hire a broker or restaurant real estate advisor be sure they work on your behalf not on behalf of the landlord. This type of broker is typically referred to as a “Tenant Representative”. If you find a property you like that is listed with a broker, they are working on behalf of the landlord. You should use your own broker to represent your interests. If you happen to contact a landlord broker directly, just notify them you have your own broker but wanted to get some initial information. If you are looking in a hot neighborhood for a restaurant for lease, there is a good chance you will not find any available restaurants for lease. Finding a restaurant for lease in these neighborhoods often requires patience and finding “off market” deals. You or your restaurant real estate advisor will need to contact existing restaurant owners and/or property owners. In most situations the existing restaurant owner will want to receive “key money” or sell the assets including the existing lease. This can be advantageous if the restaurant has a kitchen and layout that does not require substantial work and/or an attractive lease. If you are contacting the landlord, you will be looking to see if the lease will be expiring in the near future, if the landlord wants a new concept for their building or if the current tenant is in default of their lease. You can target off market properties by calling the restaurant operator, sending a letter or trying to speak to them in person. Tracking down the landlord can often be more challenging since they usually have a limited liability company and hide their name and contact information from the general public. Your restaurant real estate advisors can usually track down the true contact. RestaurantforSaleorRent.com allows users to search “all restaurants”. If you find a restaurant that is not listed under “restaurant for lease”, they can contact the restaurant owner or landlord on your behalf. Would you like to learn more about finding a restaurant for lease? Do you have specific questions about finding a restaurant for lease or sale?? Contact me here via email or call (310) 383-6558. Mark Chase is the President of Restaurant Real Estate Advisors. Mark provides site selection and real estate advice to restaurateurs. He works directly with growing brands and provides coaching, consulting and courses to first-time restaurateurs. Planning to move to Los Angeles I would apreciate any info for renting a restaurant. Are you planning to build out the space or looking for an existing kitchen? Availability and pricing varies greatly depending on where in Los Angeles you are looking.